Many students continue to struggle in high school math courses because they failed to master the basic mathematical skills. REA’s new Ready, Set, Go! 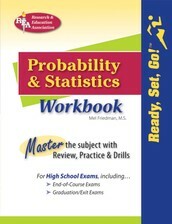 Workbook series takes the confusion out of math, helping students raise their grades and score higher on important exams. When students apply the skills they’ve mastered in our workbooks, they can do better in class, raise their grades, and score higher on the all-important end-of-course, graduation, and exit exams. Whether used in a classroom, for home or self study, or with a tutor, this workbook gets students ready for important math tests and exams, set to take on new challenges, and helps them go forward in their studies!